On route to understanding if fractals have a 'wavy' like nature, I finally put pencil to paper and drew what I've been thinking. 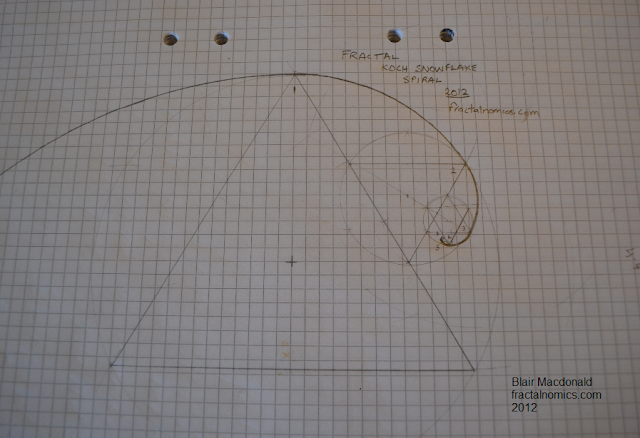 I have been pondering on what effect a 'mutation' or change to one triangle - a dot at the apex of the triangle as shown below - would have or show on the iterating Koch Snowflake. 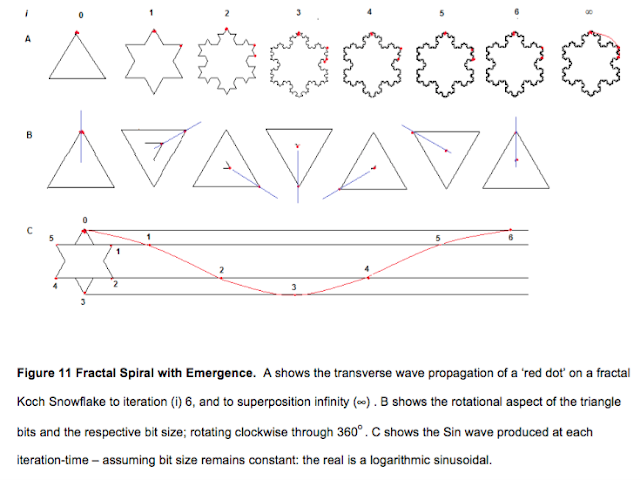 I envisaged that it would spiral to infinity as shown below. 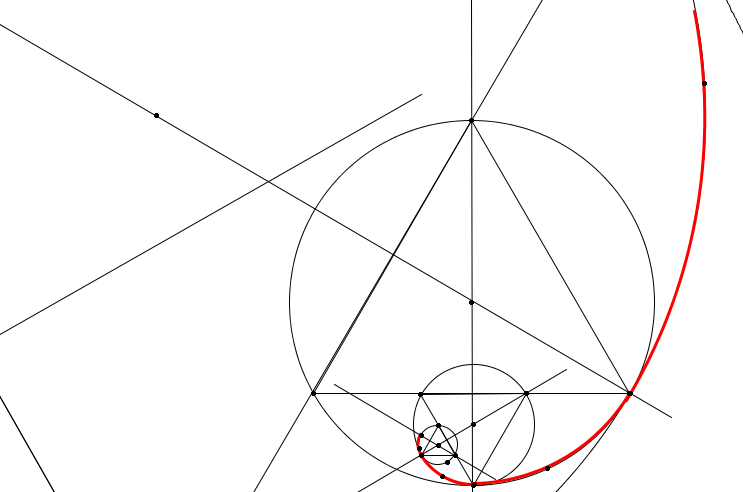 By tracing a smooth curve through the (red) 'dots' series of iterated mutant triangles, I would develop - what looks like - a kind of logarithmic spiral, or a wave or pulse if this spiral curve was viewed in the front elevation view as opposed to the plan elevation (above). 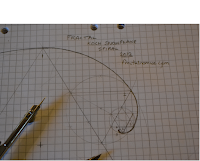 As a circles radius (what the compass is set to) scribes 6 times around the circles circumference, the three corners of the 1st equilateral triangle (iteration 1) can be produced, and the apex of the 2nd triangle (iteration 2) can also be marked. 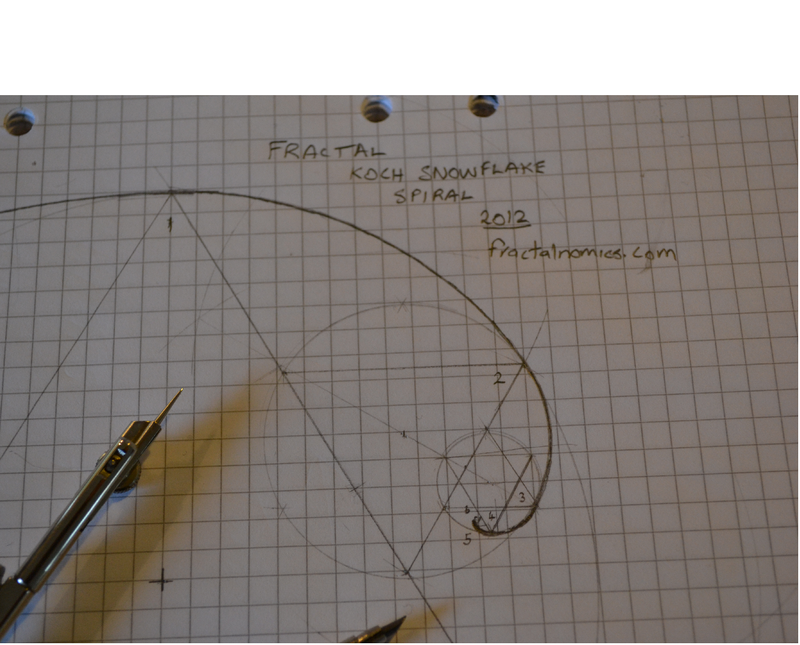 With the compass still at this 1st setting, a segment of the Koch Spiral - from apex 1 to apex 2 (iteration 1 to iteration 2) - is created. 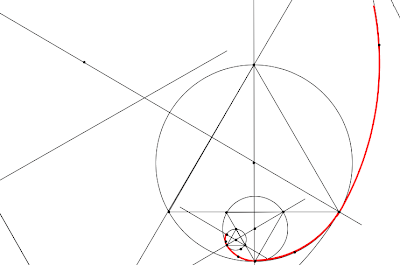 The apexes of every triangle in the iteration series are the tangent points of the spiral. Find the centre the 2nd triangle, and repeat the process. The process can be repeated - both zooming in or zooming out - to infinity. 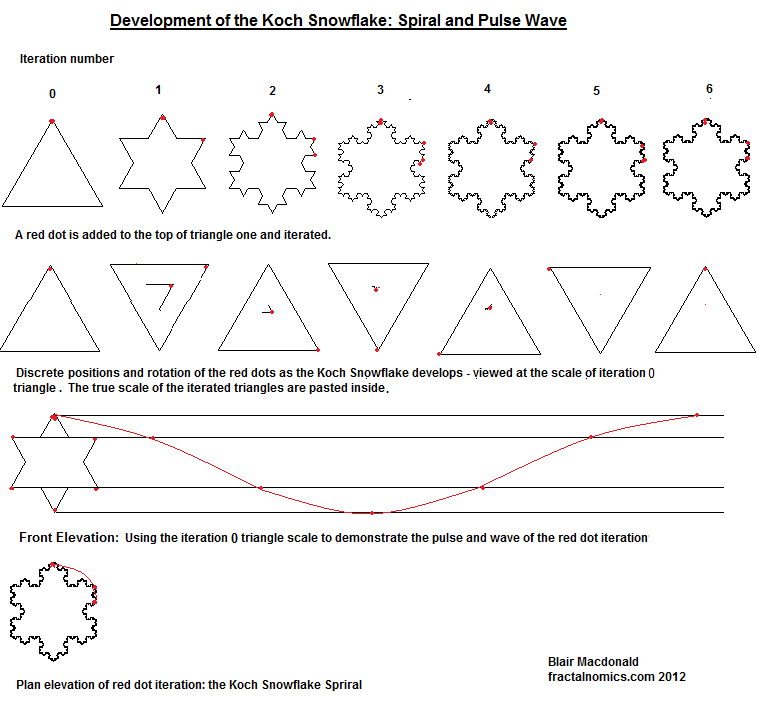 Asymmetric circles developing the Koch Spiral. More to come, and refer back to my entry on wave particle duality. The figure below is the Koch Snowflake Spiral developed using Nspire software. I had trouble drawing this new curve neatly (by hand). 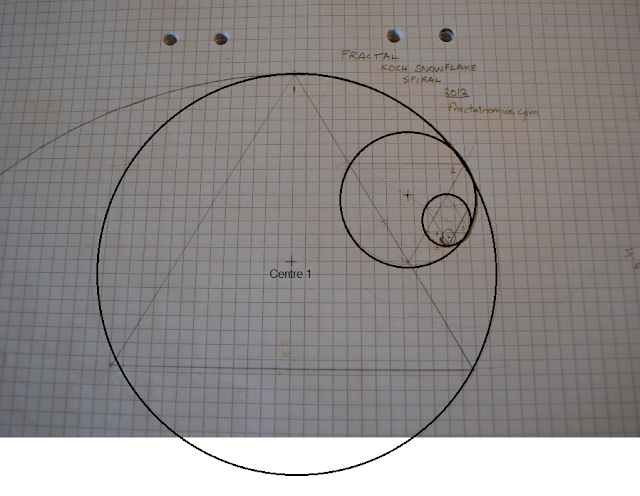 It wasn't until I reviewed the method of drawing the Golden Spiral - through circle arcs - that I thought circles too could possibly be a method of completing a neat approximate 'Koch Spiral'. 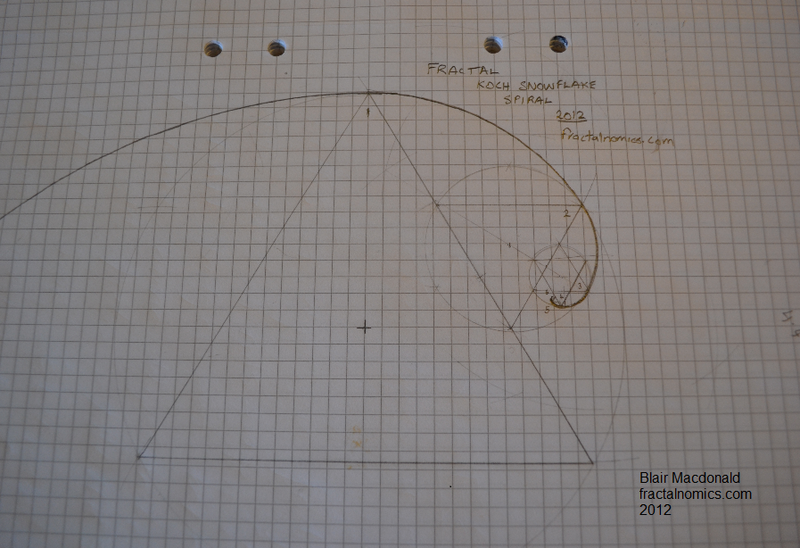 Having once studied technical drawing at secondary school, a method quickly came to me. Pi * 2r = circumference, not exactly 6r. So if the sentence reads "As the radius fits a little less than 6 times into its circumference", what effect would that have on the fitting of circles to the snowflake? Would the scale be different? Sorry for the mis-understanding Wholeo, a little hasty of me, and a little relaxed - I have updated the entry, and also see the link I added. It is all to do with a circle/compass geometry trick that fits 6 times rather than Pi. Thanks for checking. There is lot to learn from his book which can help to proceed further in this field.